This project came up quite unexpectedly. It was rather urgent, too, to protect an innocent brand-new iPod from either being damaged in a bag or lying in a drawer waiting to be used. The answer was simple at first: A cozy was needed. Only question that remained was how it was to be made. Despite its utmost urgency, I decided that a plain cozy was too boring. I’d discovered this beautiful pink wool in my local wool shop, and I was determined to turn it into something special. Owls are everywhere at the moment. And I think they are super cute. 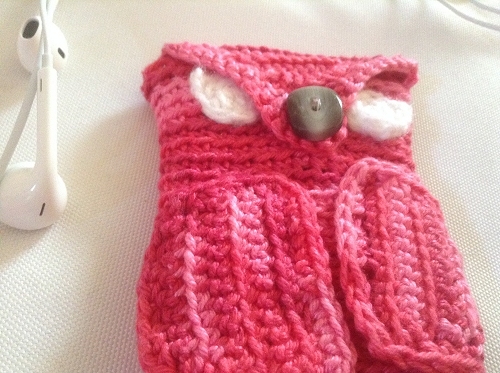 So I went for a crocheted owl cozy. Problem #1: I have very little experience in crocheting. All I had crocheted before this were two pairs of pot holders, and that was at least 3 years ago. I hardly ever did manage to fulfill any of them.